Board Certified in Dermatology, Dr. Elizabeth Reisinger earned her medical degree from Philadelphia College of Osteopathic Medicine where she graduated with honors. 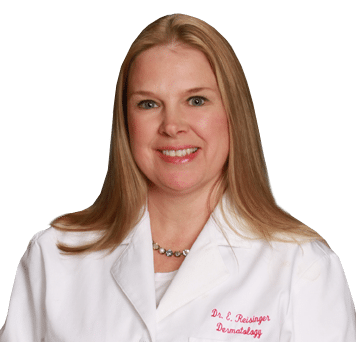 Dr. Reisinger completed her residency in Dermatology and Cutaneous Surgery at Broward General Medical Center/Nova Southeastern University in Ft. Lauderdale. She served as chief resident of the dermatology program. She has been practicing medical and cosmetic dermatology since 2000. Dr. Reisinger enjoys working with her patients to help them achieve optimal outcomes for their dermatological issues. Dr. Reisinger says that “Dermatology is a unique specialty. It’s combination of medicine, surgery, and cosmetics”. She thoroughly enjoys all aspects of her job and patient care. Dr. Reisinger was born and raised in southwestern Pennsylvania. In her off time, she enjoys spending time with her family and friends and rooting for her hometown Pittsburgh Steelers and Pittsburgh Penguins.